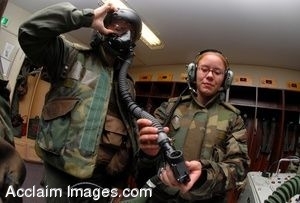 Description: Clip art photograph of U.S. Air Force Airman 1st Class Victoria Watkins, right, from 44th Fighter Squadron, checks the helmet of 1st Lt. Jason Roth, a pilot from 67th Fighter Squadron, to ensure its computer systems and breathing apparatus are in compliance with Air Force regulations prior to his flight during a combat capability exercise Oct. 19, 2006, at Kadena Air Base, Japan. (U.S. Air Force photo by Senior Airman Jeremy S. McGuffin). Clipart photograph by Department of Defense Public Domain.